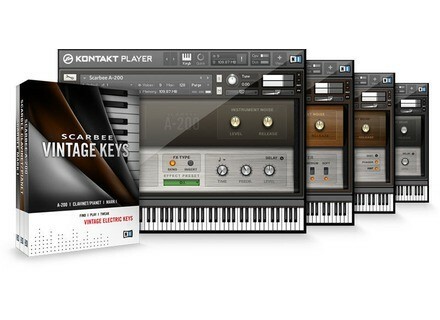 Scarbee Vintage Keys, Virtual Electric Piano from Native Instruments. songboy's review"One of the best sampled libraries I have every used." This package contains only multi-sampled instruments. 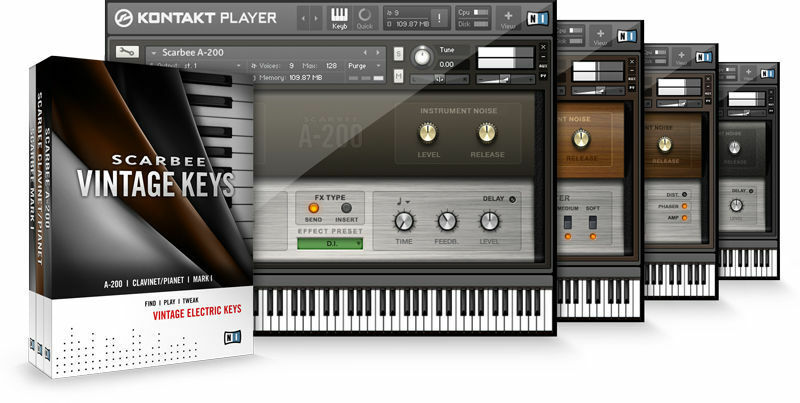 These instruments are designed to be used in Native Instruments Kontakt. If you are familiar with Kontakt, then these instruments will pose no problems. Simply load them into your set, set the midi control and you are good to go. The setup of each instrument is fairly simple, offering a few "built In" effects such as Reverb and delay that can be manipulated from the front of the plugin. Other than that, they are simply setup to mimic a Rhodes, Whurly and a Clavinet which are essentially simple instruments. The sound quality of these samples are superb. I stopped luggin my 88 key Rhodes Mark 1 out to gigs because it was just too heavy and was in search of a decent enough software replacement. Although nothing beats the real thing, these plugins come so close that I don't even think for a second of dragging the heavy beast out anymore. I run these samples in Kontakt of course with a Macbook Pro i7 and an RME Fireface 800. I can get the latency down to 3ms which is imperceptible to my ears and is absolutely necessary for any serious keyboard musician. Anyone who needs faithful reproductions of these beautiful instruments can look no further. What I like most about these plugins is the quality of the sounds and the fact that I can get the latency so low that I don't hear it. What I don't like only applies to the Clavinet. Using the "Full" Preset is extremely CPU intensive and requires that I increase the buffer which causes more latency. I only use the "upper" preset and that seems to work fine at 126 samples. Other than that, I love everything about it. Although you need to buy Kontakt 5 which can cost up to $400 first, spending $169 for these plugins is a small fee for such solid samples. I have not heard a software version of these instruments that can best this library. I have used many different software versions of these plugins including Lounge Lizard, GSi, and built in patches in Logic and Ableton and Scarbee bests them all. Yes, I highly recommend this library to any Kontakt owner.